Chocolate chocolate chip cookies baked using high altitude adjustments to the recipe ... perfection! It's that time of year when social opportunities abound. The weather is warm, the days are long, and it just feels right to light up the grill and invite friends over for a long lazy evening under the stars. And most of the time, backyard cooking involves some sort of potluck element, with the host grilling brats or burgers and everyone else supplying side dishes and dessert. And what better way to end a meal than with a homemade goodie of some kind? Living in Castle Pines means living at high altitude (we're at roughly 6,500 feet) and that can mean cookies that spread like a pancake and cakes that rise and fall like Vesuvius. So how to find a sweet ending to a backyard party that won't leave everyone feeling, well, deflated? Colorado cookbook author and baking teacher Randi Levin – also known as the "Muffin Lady" – has lots of tricks to combat the challenges of a high, dry climate. A native of the east coast, Levin came to Colorado in the 1970s and was dismayed to find that many of the goodies she had grown up baking for friends and family just didn't work in Colorado. "I came from sea level and knew nothing about how higher elevation combined with dry thinner air could affect a good but basic chocolate chip cookie recipe," said Levin. Her first project was finding a way to perfect those chocolate chip cookies. She added a bit more flour and has been tinkering with baked goods ever since. Decreasing leavening ingredients like baking soda and baking powder ever so slightly. When measuring the leavening agent (baking soda or baking powder), indent your finger into the ingredient a tiny speck when leveling the measuring spoon and push the excess back into the container. This leaves a little visible indent in the ingredient, and decreases it accordingly! Unless indicated otherwise, use butter only at room temperature so that batter and dough mix easily – overbeating often times can cause problems at high altitude. Add a bit of extra flour (roughly a slightly rounded tablespoon for an average-sized batch of cookies) to baked goods to help them hold their shape and texture. There is no need to use "high altitude" flour. Always use large or extra large eggs, also at room temperature. 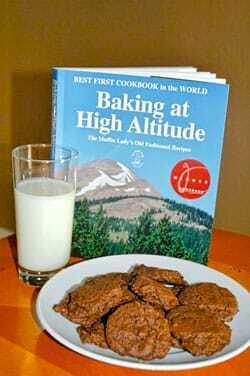 For more information on high altitude baking and cookbooks or to sample a few of Levin's recipes, go to www.themuffinlady.com. Levin's book is available at Amazon.com for $15.